BUCYRUS — The Crawford County Sports Hall of Fame induction banquet is March 24 from 5-9 p.m. at the Trillium Event Center, 1630 E. Southern Ave. Tickets — $20 for adults, $10 for children between the ages of 5-12 — are available by calling 419-571-6284. Erin Ebner Shawk participated in track all four years at Colonel Crawford High School and graduated in 1992. The track star led the Lady Eagles to victory in the Division III state meet her senior year. She placed first in the 100 meter dash, with a time of 12:47 seconds, and helped her 4×100 relay team win first place with a time of 50:14. Erin participated in four events at the state meet. Additionally, she set a state record in winning the 100 meter hurdles in 14.59. During Erin’s senior year, she had surgery on both of her knees. She credits Coach Rick Keller for helping her to rehab and work hard to be ready for her senior year of high school track. Shawk ran track at Miami University and is still listed on the Miami University’s Top 10 all-time for the 100-meter dash. Erin competed nationally and internationally, winning international titles in the sprints, hurdles and relays. She gave up running after two seasons in Miami because of her bad knees. She graduated with a degree in education. She met husband Jason at track practice in ninth grade. They have two sons. Erin is active in community theater and the Ohio Farm Bureau. 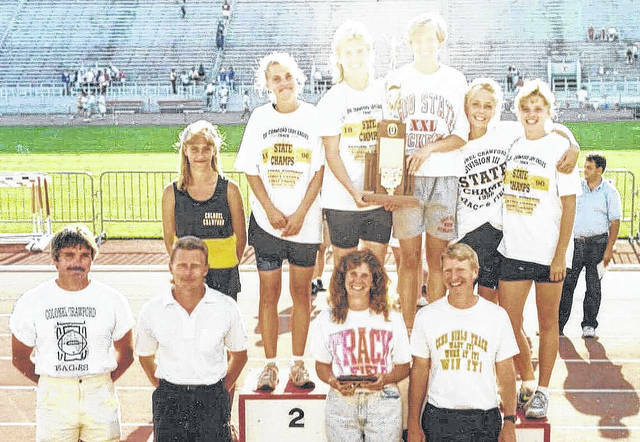 The 1991 Colonel Crawford girls track team won the state team title in 1991, successfully defending the title they won the year before. The first event of the day was the 100-meter hurdles in which Erin Ebner (15.06) and Ashley Lawson (15.24) finished second and fourth, respectively. The 800 meter relay (1:46.07) of Michelle Stuckman, Dawn Spears, Christi Laughbaum and Ebner defended their state title from the previous year. The 400 meter relay (50.25) of Ebner, Robyn Fogle, Laughbaum and Stuckman did the same in defending their state title from the previous year. Lawson (44.97) and Ebner (47.13) finished first and sixth, respectively, in the 300 hurdles. Stuckman locked up the state team title with her third-place finish (26.4) in the 200-meter dash. 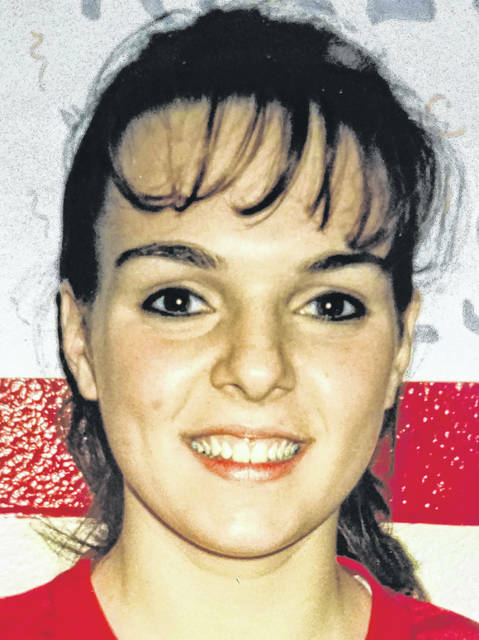 Stephanie Striker Burns was an all-around athlete at Buckeye Central excelling in volleyball and basketball. She earned four varsity letters in each sport and played softball and track. She is the only Buckeye Central athlete to have been a member of two state volleyball championship teams, in 1993 and 1996. She was a first-team all-Ohioan and her volleyball teams went 95-9 during her high school career. As a member of the basketball team, she was named an All-Ohioan three times. Stephanie hold several school records including field goal percentage in a season (62 percent), single game scoring (39 boards), all-time leading rebounder (797) and is the career scoring leader for the Buckettes with 1,335 points. She graduated in 2001 from Eastern Michigan University. She currently lives in Farmington Hills, Michigan, where she works in compliance for a utility company. 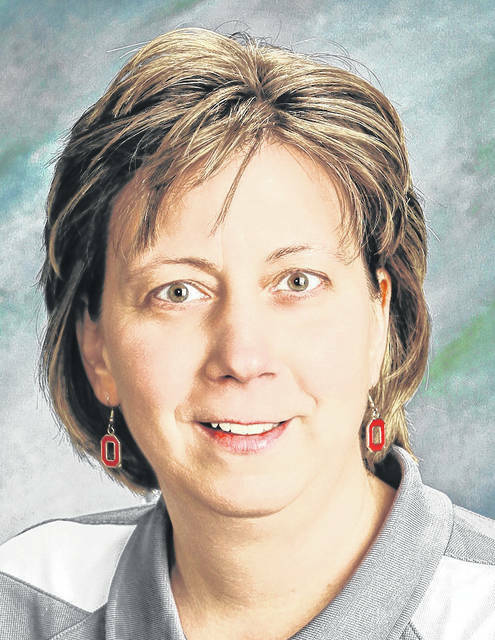 Nancy Ackerman is a 1983 graduate of Buckeye Central High School where she participated in volleyball, basketball and softball. She was a member of the 1982 girls basketball team that finished second in the state. Nancy was the head volleyball coach at Buckeye Central for 14 seasons from 1988-2001 and currently is a varsity assistant. The teams she coached have an overall record of 307-56. Her teams won nine league titles, and appeared in the state Final Four seven times (1988, 1991, 1993, 1996, 1999, 1997, 2000, and 2001. Her teams won a state championship in 1993 and 1996. The 1993 team went the entire season without ever having to go to a third set. The overall record was 27-0 (54 straight games) and they outscored their opponents 810-286 in overall points. Ackerman was a district coach of the year eight times and won the OHSVCA Coaches Outstanding Achievement three times. She coached eight all-Ohioans. Nancy is married to Aaron, and they have two daughters. 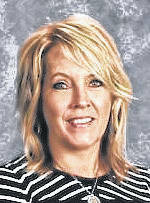 She is the current treasurer of Buckeye Central schools. 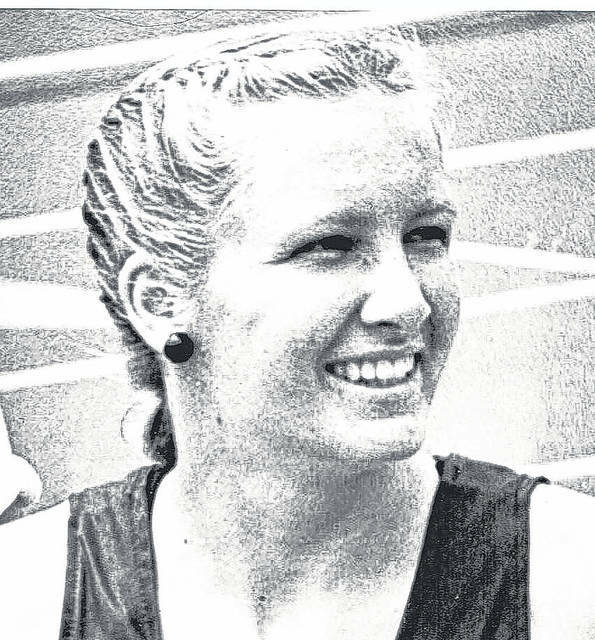 Krista Sand Haubert, of Wynford High School, was the State Class A long jump champion in 1983, at 18-feet ¼ inch. She placed sixth at state as a member of the 800-meter relay team, and fifth in the 100-meter hurdles. She was on the track team four years, and qualified for state three times. She is the all-time career point leader in girl’s track and field. In 2009, she was named to the Wynford Athletic Hall of Fame. Krista went to Malone College and competed in track three years. She graduated with a degree in Communications. She lives in Canton with her husband Doug. They have four children. Krista is the community relations coordinator at Portage Lakes Career Center. Tim Gebhardt played varsity basketball at Wynford during the 1969, 1970, 1971 seasons, in which the team went 55-9 record. Gebhardt scored 1,168 points during his basketball career and helped his teams to consecutive North Central Conference championships. In 1971, Wynford was third in the Associated Press Poll and the UPI poll. He was a first-team All-Ohioan that year. He also was was the starting shortstop on Wynford’s 1970 regional qualifying baseball team. Tim played basketball at Muskingum College where he earned three varsity letters. He set a record for making 114 free throws in a row. He was an active high school basketball official for 43 years, and for 33 officiated girls NCAA games working numerous tournament games. 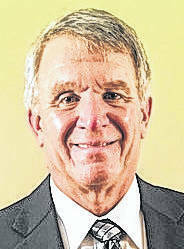 He is a member of the Wynford Athletic Hall of Fame and Ohio Basketball Hall of Fame, among others.